I just did an interview with Lana Durjava for Slovenian radio station Radio Student. The introduction is in Slovenian, but starting around 9:40, the interview itself is in English. It’s very wide ranging, and we really get into the ways that specific drugs appear in history and in literature. 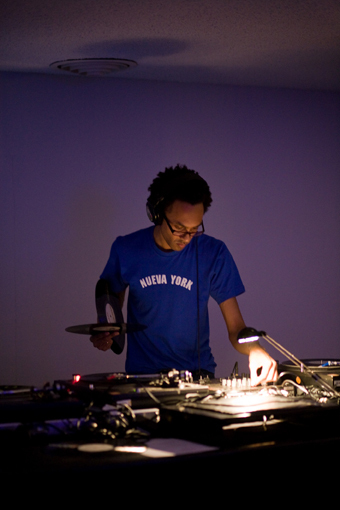 I’ll be talking with DJ /rupture a.k.a. Jace Clayton next Monday, December 27th on his WFMU show, from 6-8 p.m. Jace is one of the finest DJs on this planet or any other, and one of the deepest thinkers about dancehall sounds in the age of globalization. I’ve learnt a lot from him over the years. In particular, his blog, Mudd Up! is a must read for anyone interested in understanding new global dance sounds. He has some interesting things to say about In Praise of Copying. Aside from talking about World Music 2.0, the global rise of Autotune, and how to live in a world of copies without originals, I’m going to play some music: expect Kuduro, Logobi, Saharan psychedelia, Ramadanman as well as some clips from other folks’ mixes and some archival hauntings. Listen to the podcast, in two parts, here. I had a very interesting hour long conversation yesterday on Connecticut NPR’s Where We Live show, hosted by John Dankosky, exploring the relationship between copying and creativity. You can download the podcast here. Joining me were musician/theorist remix guru DJ Spooky and law professor Susan Scafidi. Spooky was one of the first to point out in his book Rhythm Science (2004) that sampling is not just something that hip-hop artists do with old records, but that processes of cutting and pasting, appropriation and montage are fundamental to the way that all human cultures work, whether they recognize it or not. Spooky’s comments in the interview yesterday about the way a good copy is situational, responding to the environment in a meaningful way help me to rethink an ethics of copying. A bad copy by extension would be one that is insensitive to or ignorant of environment and relationships. But that raises the question of what is appropriate, and for whom, which is a difficult question. Cheap knock-off bags may be bad because they show a lack of attention to the qualities that go into making a high end bag, and because they perhaps intend to deceive. But from the point of view of poor people who can’t afford expensive branded bags and who enjoy the styling, they may be good. I’m a great fan of Susan Scafidi’s blog Counterfeit Chic, which taught me a lot about brands and their various doubles. Scafidi is the director of the Fashion Law Institute at Fordham U. (the first institute of its kind) and the author of Who Owns Culture? Appropriation and Authenticity in American Law (2003). What struck me the most in our conversation yesterday was Scafidi’s cautionary note about there being a taboo on copying because copying comes too easily to us. I accept the importance of the taboo, and the way it is managed through laws and traditions, while wanting to be very conscious of the particular political and economic histories that our own responses to the taboo have been shaped by. In other words, contemporary IP law is only one of a number of possible ways of responding to a need to control the proliferation of copies, and much of our fear of copying today is actually a fear of a different, possibly more fair society. An interview with me re. copying and related matters in Rorotoko.